Patently Apple highlights an interesting Apple patent application published by the U.S. Patent and Trademark Office today. The application describes a removable clip for a mobile device such as an iPod, with the clip integrating tactile or trackpad like controls to be used either while attached to the device or as a remote control. In one embodiment, an apparatus includes a body having a bend and a user interface area, a connector adapted to couple to a corresponding connector on an electronic device, and a plurality of conductive elements. The bend enables the user interface area to wrap around a portion of the electronic device when the connector is coupled to the corresponding connector on the electronic device. In another embodiment, a portable electronic system includes a removable user interface and an electronic computing device having a display surface, where the removable user interface is couplable to the electronic computing device such that the removable user interface is disposed over at least a part of the display surface. 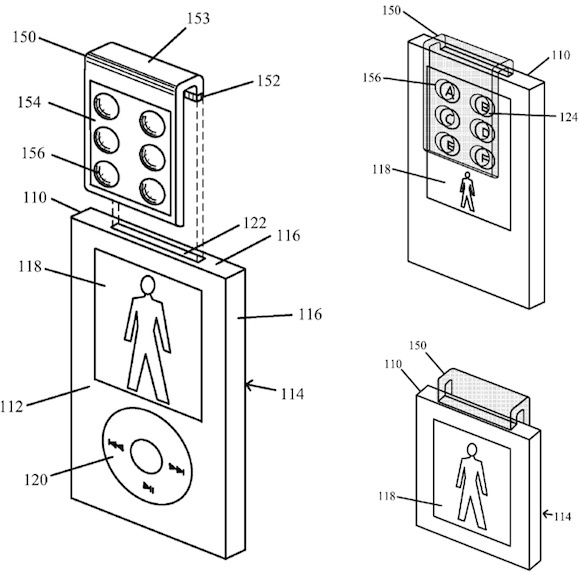 Despite the patent application having been filed in July 2011, the diagrams in some cases depict a classic iPod with a relatively small screen and a click wheel on the front of the device. Various embodiments of the invention show the touch portion of the clip being used on the front of the device, either with on-screen content shrinking to fit below the clip or with content being displayed behind the transparent clip to provide a dynamic interface for the clip's tactile buttons. Alternatively, the clip could be mounted in reverse to place buttons on the rear of the device, or removed entirely and clipped onto a connector on a headphone cord to serve as a remote control for the device. As with many of Apple's patent applications, the removable clip may never make an appearance in an Apple product, but the document provides an interesting glimpse at some of the areas of interest for Apple, and certain aspects of the technology could eventually appear in a different form. I have no idea what this apparatus does. I miss the times Apple filed patents for rounded rectangles. At least I understood those things. Samsung will do this with a 9 inch clip version and claim they always had it! Does anyone else have the feeling that this isn't for a product that Apple wants to make, but for a product they want to prevent the competition from making? Is it really that hard to figure out? I think it's a brilliant solution to a very annoying problem. Imagine you're walking and have your iPod in your pocket. A song comes up you don't want to listen to. If you have this clip-on device attached, you can simply reach in and hit the next button--easy to find in your pocket since it's got actual buttons. This is something that is next to impossible to do with the current generation of iPods and iPhones that are primarily controlled by touch. Now, let's see if Apple is smart enough to design this to also work as a game controller. Looks more like some paper work they forgot to file from 6 years ago ... I could see this being pretty handy for Joggers ... would be nice to have some tactile feedback. Great - another remote to lose down the back of the sofa. "Find my remote". I understand the problem, but doesn't the headphones apple brought out with buttons/voiceover/mic defeat this? Having the small block on the headphones is a fantastic and innovative way of controls that are on-hand and there without cluttering up a design, and the user's space: what problem does this clip-on tool solve that other products that haven't done in the past? That's the true mystery of this Patent.